I love the trend of stories that are done in the male lead’s POV, and this was exactly that. I think that we can all happily say that the story of Travis and Abby was one of great passion (be it good bad or otherwise) so it was nice to see it from Travis’s side of things. What i really enjoyed about this story is that while in BD we got the sense that Travis had this past that made him into a tough guy, it’s really more to the point that his mother’s passing was the reason that he was the way that he was. His mother’s parting words were to ‘fight for what you love’ and because of that, he found that he was wary of loving and then found that it was really hard to do that. The journey that walking disaster took us on was one of jealousy and uncertainty. i think that Travis really didn’t think that he was worthy of anything, of being good enough for someone that was good and even that he was worthy of his family. he grew past the struggles of a father who had a hard time adjusting to being a widower and 4 older brothers that were tough guys on their own. All in all, the BEST part i think was the epilogue in this installment. I didn’t think that we were going to get that story at all – and i think that i was a FANTASTIC addition and closure to the whole story. If for nothing else, this just shows that you can have a ‘stand alone’ story with a reverse POV and wrap it up all nicely so that there’s no want for another book in the series. NICELY DONE is basically what i can say about this book. 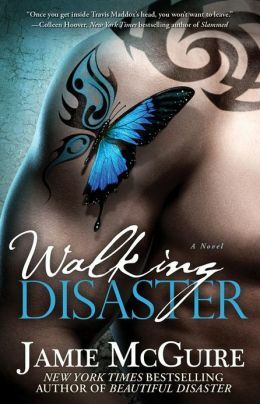 This entry was posted in Reviews, Young Adult and tagged Beautiful Disaster, Jamie McGuire, Walking Disaster, YA lit by iscm13. Bookmark the permalink.